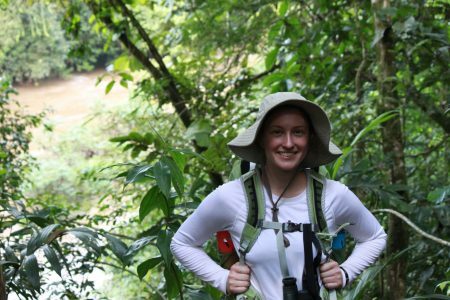 Renee’ Russell ’16 recently completed field research on monkeys in the wild as part of the Maderas Rainforest Conservancy program in Costa Rica. 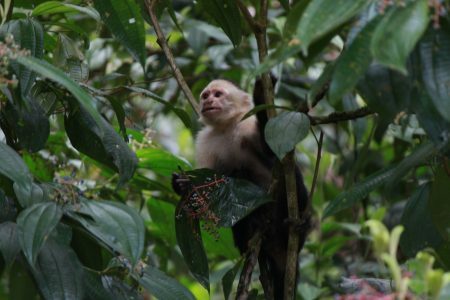 She was posted at the La Suerte Biological Field Station, and did a comparative project on vigilance in two of the three monkey species—white-faced capuchins and howler monkeys—that live on the site. Vigilance, in the field of behavioral ecology, is an animal’s examination of its surroundings in order to heighten awareness of predator presence. A scholarship from the American Society of Primatologists helped fund Russell’s tuition for the field school. Russell is also currently working towards her master’s degree at Bucknell University. “While not a requirement for my master’s program, it was nice to supplement the research I do in the lab with the field research,” Russell said.